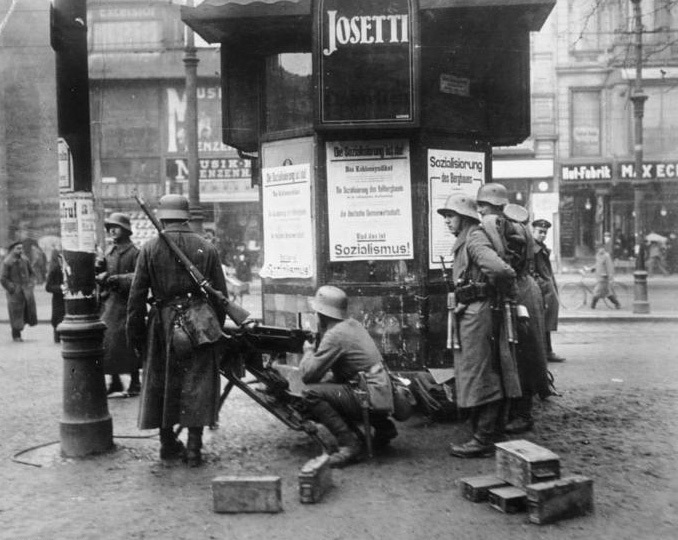 In March 1920 a group of army officers, Freikorps and right-wing nationalists attempted to overthrow and replace the SPD government. The Kapp putsch, as it became known, exposed the political divisions of the young republic and the weakness of the new government. The putsch was eventually thwarted by public opposition, divisions within the military and misjudgements by the men who initiated it. But it highlighted the fact that German militarism was far from dead. The Reichswehr (army) remained an important and potentially influential political force. The government, in contrast, seemed weak and at risk of being easily overthrown. Even before the November 1918 armistice, Germany was fast becoming a hotbed for reactionary groups and political extremism. The defeat suppressed the nation’s faith in and affection for monarchism and ultra-nationalism – but only in some circles. These ideas instead took refuge in a number of political parties and fringe groups, who clung to theories like the Dolchstosslegende (‘stab-in-the-back legend’), a baseless conspiracy theory that Germany had lost the war because of treacherous elements in the civilian government. The Dolchstosslegende allowed the military to dodge criticism or accountability for Germany’s defeat in 1918. Military commanders like generals Paul von Hindenburg and Erich Ludendorff, who were both public exponents of the Dolchstosselegende, both avoided personal responsibility – in fact both continued to be feted as heroes. As a consequence, the ‘stab in the back’ legend contributed to the survival of German militarism and military prestige, at a time when they should have been scrutinised, criticised and dismantled. As the army was demobilised and its soldiers discharged, they returned to civilian life – only to find Germany exhausted by the war, starved by the Allied food blockade and disrupted by attempted communist revolutions. Civilian jobs were hard to come by so many ex-soldiers found themselves out of work. Many joined the ranks of the Freikorps, the paramilitary brigades and militias formed to suppress the Spartacist revolution in early 1919. By the middle of the year Freikorps membership was estimated at around 300,000 men. Its numbers grew in response to the Treaty of Versailles, which limited the size of the regular army to just 100,000. Military commanders and some in the government encouraged and supported the Freikorps. General Hans von Seeckt, for instance, considered the Freikorps to be an important reserve army, illegal under Versailles but essential for the defence of Germany (in some quarters the Freikorps was known as the ‘Black Reichswehr‘). As the Freikorps grew steadily through 1919, the relationship between Ebert’s government and the regular Reichswehr deteriorated. The civilian government urged reductions in the Reichswehr and structural reforms to its officer corps and recruitment – the first to comply with the terms of Versailles, the second to ensure the Reichswehr’s compliance and its loyalty to the republic. Reichswehr generals resisted these changes. They opposed significant reductions, claiming they would put Germany at risk from external threats or an internal revolution. The Reichswehr officer class was also panicked by rumours, totally unfounded, that the government was about to consent to the extradition of some officers to Allied countries, to stand trial for war crimes. Some officers began to talk of a military putsch to remove the SPD government. One of their number was Walther von Luttwitz, commander-in-chief of Reichswehr divisions in Germany’s north, one of the country’s highest ranked officers. Militant Bolshevism threatens us with devastation and violation from the east. Is this government capable of fending it off? How will we avoid external and internal collapse? Only by re-establishing the authority of a strong state. What concept should lead us in this endeavour? Nothing reactionary, instead, a further free development of the German state, restoration of order, and the sanctity of law. Duty and conscience are to reign again in German lands. German honour and honesty are to be restored. But the response to Kapp’s rallying cry was a combination of military indifference and public opposition. The Reichswehr found itself so divided by the putsch that it did almost nothing. 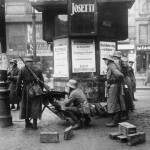 The army defied government orders to move against the rebellious Freikorps in Berlin – but it also ignored Kapp’s call to arms against the government. SPD ministers called on the German people to resist the “counter-revolution” and protect the republic by implementing a general strike. This move was broadly supported by the USPD, other left-wing and centrist parties and trade unions, which provided organisation for these strikes. The response was rapid. Within two days, Berlin had no trains, no water, no gas and no electricity. The aspiring Kapp government was confined to the capital and paralysed by what one socialist called the “terrible silent power” of the general strike. Five days after it had begun, Kapp and von Luttwitz’s attempted coup fizzled and both men fled Berlin. Ironically, the Kapp putsch almost triggered the communist revolution it was fomented to prevent. The mobilisation of KPD, USPD and radical union groups in response to the putsch led to several communist insurrections around Germany. Red Army units took control of several cities in the Ruhr region, only to be suppressed by the Freikorps and Reichswehr within three weeks. The SPD government was exposed as tenuous, fragile and easy prey for revolutionaries. The Reichswehr, which should have come to the government’s assistance, had failed to do so and left the government to its own fate. The Freikorps, a group the civilian government had encouraged and relied on January 1919, seemed to have turned against it. The realities of power and influence in the republic had been painfully exposed. 1. In 1919 the Weimar government attempted to reform and downsize the military, in line with the Versailles treaty. 2. This was resisted by some in the Reichswehr who claimed Germany would be exposed to communist aggression. 3. In March 1920 a large Freikorps brigade seized Berlin and a public servant, Kapp, claimed the chancellorship. 4. The attempted putsch failed within days after the Reichswehr ignored its calls and a general strike paralysed Berlin. 5. The Kapp putsch exposed the critical weakness of the Weimar government and highlighted both the Reichswehr and Freikorps as forces of considerable political influence. J. Llewellyn et al, “The Kapp Putsch“, Alpha History, accessed [today’s date], https://alphahistory.com/weimarrepublic/kapp-putsch/.